In patients receiving antifungal therapy, T2Candida identified bloodstream infections that were missed by companion blood cultures. Infections of the nosocomial bloodstream are most commonly caused by Candida species. Despite antifungal therapies, mortality rates for candidemia are ~40%. These poor outcomes stem from poor sensitivity of blood cultures, the current diagnostic gold standard. Therefore, improved diagnostic tests for candidemia are a medical priority. 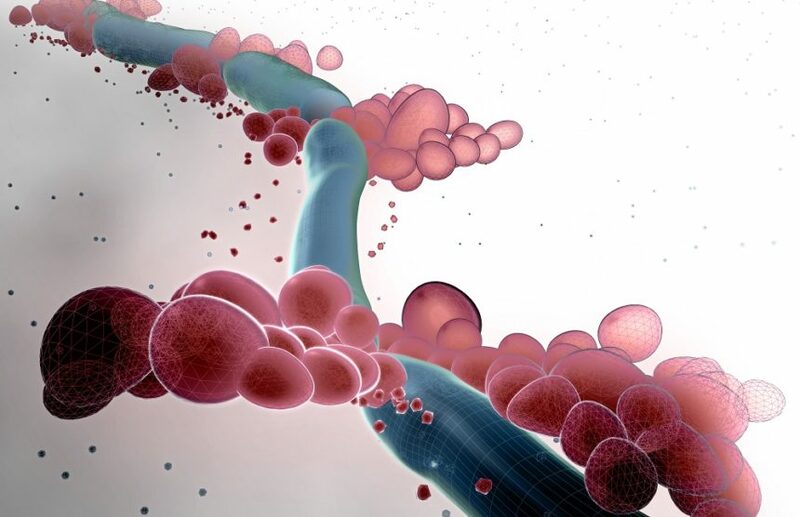 In a previous multicenter trial (DIRECT; ClinicalTrials.gov identifier: NCT01752166), a novel nanodiagnostic panel that uses T2 magnetic resonance (MR) to detect Candida sp in whole blood samples directly, called T2Candida, was evaluated. From March 2012 to August 2013, patients age 18 to 95 years old were enrolled at 14 different centers. All patients tested positive for candidemia using diagnostic blood cultures (dBCs). Follow-up blood samples were collected concurrently for companion blood cultures (cBCs) and T2Candida testing. Both the cBCs and T2Candida testing were considered positive if they detected a species present in the original dBC. If the patient received a noncommercially available drug within 30 days prior to blood collection, or if the dBC was positive for a Candida species not included on the T2Candida panel, the patient was excluded from the study. A total of 152 patients with candidemia were included in the study. In 96% (146/152) of patients, a single species was recorded from the dBC; in the remaining patients, 2 species were recovered. In 74% (112/152) of patients, at least 1 dose of an antifungal agent was administered prior to obtaining T2Candida and cBC samples. Overall, T2Candida was 89% sensitive in patients with positive cBCs. T2Candida was positive for detecting and identifying the same Candida species as the dBCs in 45% of patients, and cBC was positive in 24% of patients (P <.0001). In the absence of prior antifungal therapy, T2Candida (32.5% positive) performed comparably to cBCs (30% positive). Conversely, T2Candida (50% positive) outperformed cBCs (21% positive) in patients receiving antifungal therapy. In 1% of patients, T2Candida identified a species different from the species identified in the dBCs; in 3% of patients, T2Candida identified additional species that were not identified in either the dBC or cBC. Factors that were independently associated with positive T2Candida results were neutropenia (P =.047), C albicans candidemia (P =.015), and prior antifungal treatment (P =.01). Because T2Candida testing was performed at a central laboratory, the turnaround time for reporting results could not be measured. Based on the study results, the study authors concluded that T2Candida “ushers in a new era in which rapid molecular testing for invasive candidiasis will serve as an adjunct to microbiologic cultures.” Further research will need to assess cost-effectiveness in various settings and validation “that management strategies that incorporate T2Candida shorten time to appropriate antifungal use, reduce inappropriate antifungal use, improve outcomes, and limit the emergence of resistance,” concluded the researchers. Disclosure: This clinical trial was funded by T2 Biosystems. Mylonakis E, Clancy CJ, Ostrosky-Zeichner L, et al. T2 magnetic resonance assay for the rapid diagnosis of candidemia in whole blood: a clinical trial. Clin Infect Dis. 2015;60:892-899.